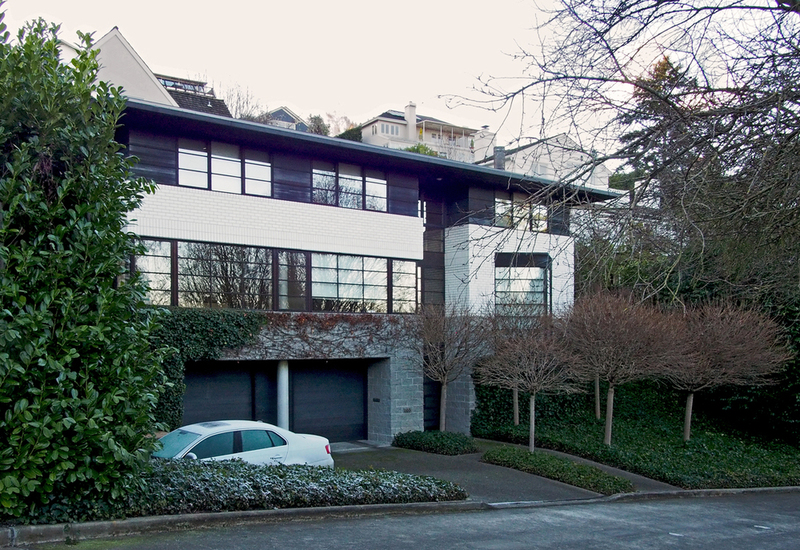 Tucked away on a narrow, winding street on the north end of Capitol Hill lies an enclave of modernist homes dating from an early 20th Century masterwork to those that aspire and are just completing construction. 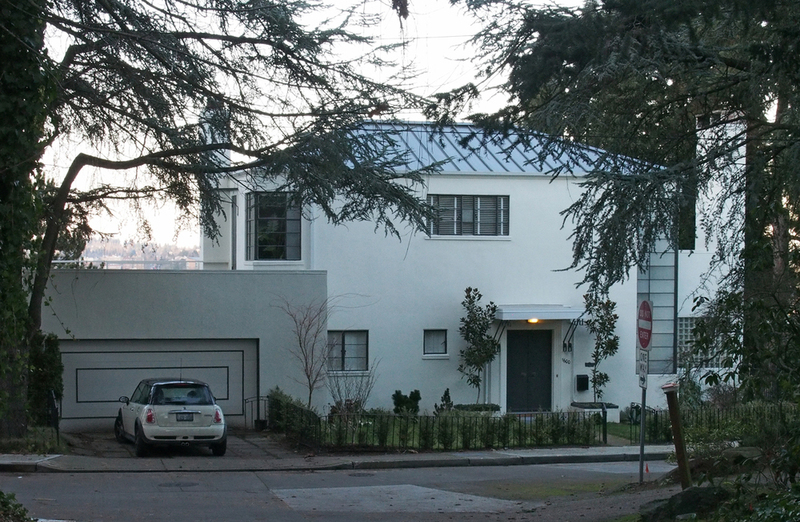 Some are exemplary, some are rather ordinary, but their grouping on the same compact hillside of Capitol Hill compounds their inherent charms and attraction. East Boston Terrace escaped my notice for years before its very existence was pointed out to me by another aficionado of modern design. At the panoramic viewpoint where East Boston Street dies into 15th Avenue East, Boston Street’s continuation could easily be confused with a driveway. 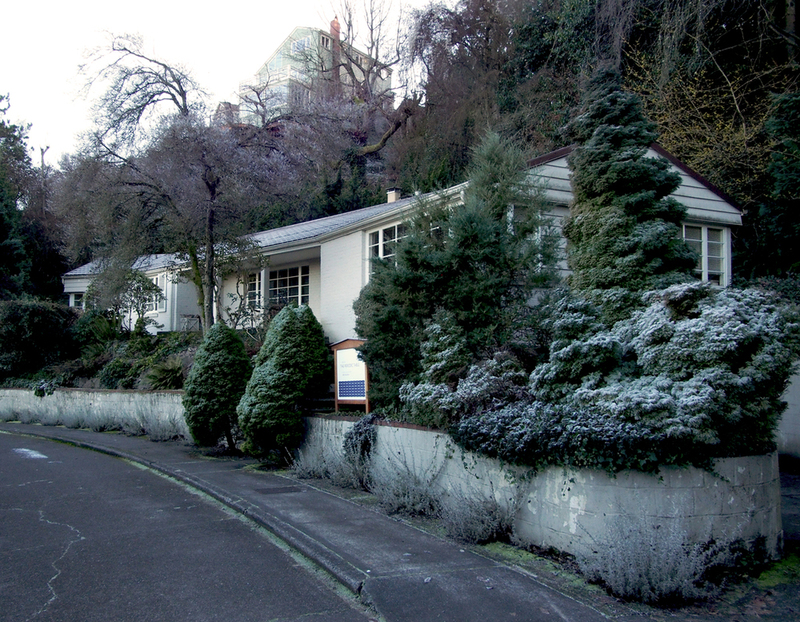 The street quickly dives into the hillside, disappearing from view, with its steep slope leading one to a protected and sheltering environment. Coming from the south along 15th Avenue, the first hint of this micro-neighborhood’s presence is the rather long, moss covered stair that takes you from the 15th/Boston bend down to Boston Street itself.Once down the stair, one is greeted by the newest addition to the mod-enclave, a tasty red and tan home, whose materials, massing, and color make it very au courant. Still under construction the chilly January morning I did my most recent walk, the building’s rather austere front elevation is in contrast, I imagine, to a fully glazed one opposite, and intended to capture what must be spectacular views to the east. Next up on the tour of modernist boxes (and I use that term in the most affectionate way), is a little grey number that I would guess is of late 1970’s or early 1980’s vintage. The tightly spaced vertical siding and the glass canopy at the entry are amongst the clues. To the right you will notice the ‘outie’ balcony; a classic modernist move. One also may notice that the car port is actually a bridge, a hint of further hillside gymnastics to come. Skipping over the next building (saving the best for last), a Frank Lloyd Wright-inspired, prairie-styled dwelling commands the fork in the road. A beautifully tended landscape is fitting for a home so sited and inspired. The hip roofs and stone base help the home blend into its surroundings, much in the manner Mr. Wright preached it ought to. E. Boston Terrace’s relative seclusion reveals itself the further one progresses into its realm, with the closest neighbors looming above, their yards forming an effective demarcation from the rest of Capitol Hill. 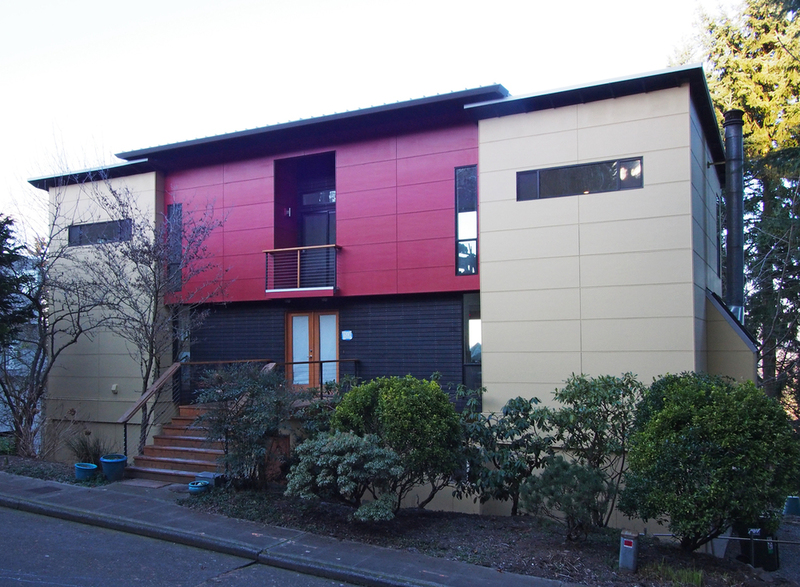 Spatially, this juxtaposition of higher and lower elevation homes in a compact space is reinforced by the homes not being aligned on the grid one typically finds in our neighborhood. Seen here in the foreground are two less obvious modernist homes. 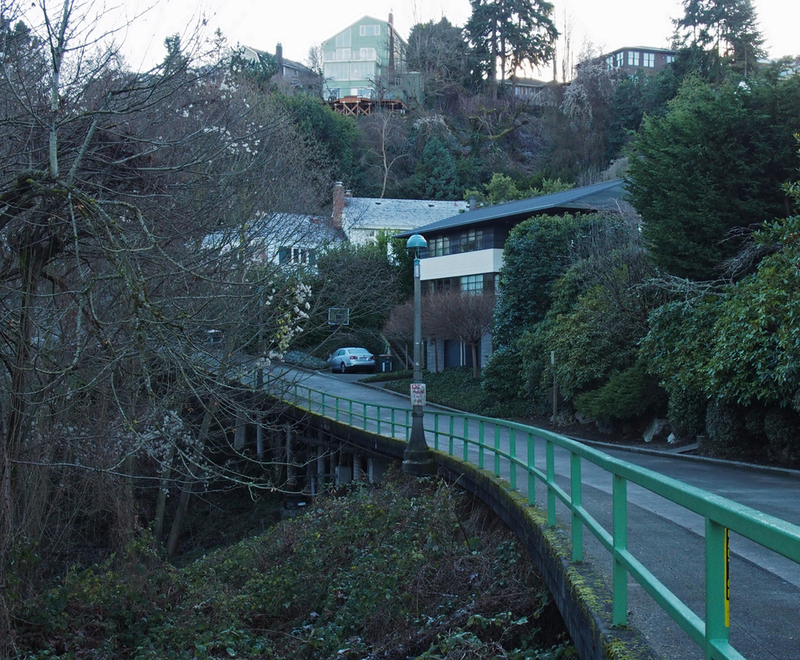 A little closer up, the rambler may appear more suburban than not, but I cannot help but speculate that when constructed, such a distilled domestic image was certainly at odds with the craftsman bungalows that filled Seattle, making this home a trend setter for its time. A subtle move to be sure, but the way the home allies itself with the curve of the street hints at its less-than-traditional posture. The hillside situation of Boston Terrace not only produces interesting visuals on the uphill side, but as you can imagine, on the downhill side as well. On this particular morning, I was fortunate enough to catch a view of the Cascades in all its winter splendor. Backing this spectacular view is a more recent contemporary home. While it’s difficult to discern its exact vintage, the split face concrete block at the base hints at the 1990’s. That presumption is partially undermined by the apparently steel-sashed windows which typically hint at a much older home. Kudos to both architect and owner for seeing the value in installing such gossamer windows – their delicacy and transparency come at a premium price – but, with the view they engage it was clearly worth it. Another nice modernist touch is the simple and highly ordered landscape, comprised of uniform and geometrically deployed trees set in a carefully manicured ground cover. The infrastructure enthusiast in me is impressed by the extent to which bridges and roads are engineered to provide access to these otherwise inhospitable locales. I could not help but be impressed by the determination to build a road on this hillside. Have a look at the pilings supporting the roadway/bridge in front of the home just discussed. Now for la pièce de résistance and the true inspiration for this post -- a great white box that sits across from the above-mentioned prairie style home. The term modernist gets thrown around a lot, including by me. Despite this etymological transgression, there is an image that I and many others hold as truly modernist -- that of the early 20th Century, European-based, International Style pioneered by architects such as Walter Gropius. Although by no means ignored in the United States, it never quite captivated the imagination as it did across the Atlantic. To be sure, later American designers took such inspiration and molded it as their own, as shown by the designs of such masters as Eero Saarinen and Craig Ellwood. These later accomplishments aside, the pure white box antecedent was rare in the US, and rarer still in the Northwest (as opposed to California, the upper Midwest, and the Northeast). However, we do have at least this one on the Hill, and it is such an outstanding example it almost makes up for the dearth of others. 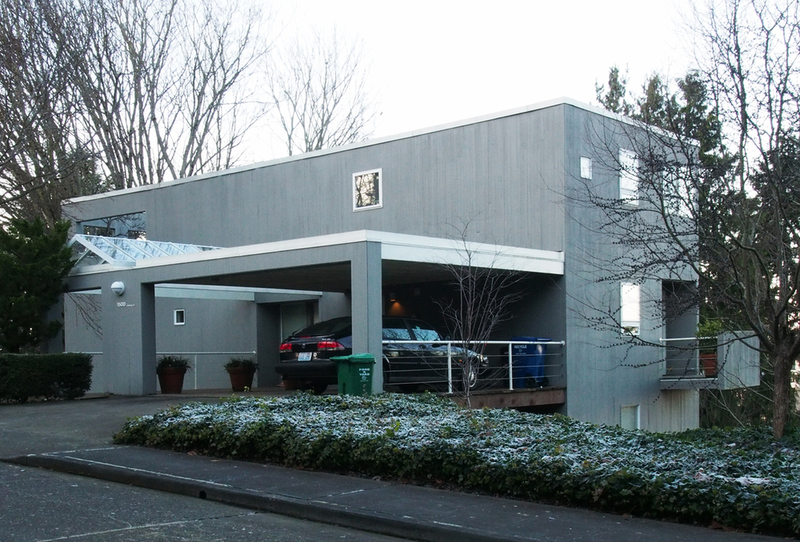 From the looks of it, this home falls squarely in the 1930’s, and my guess is the work of Paul Thiry, one of Seattle’s legendary architects whose oeuvre includes Key Arena and much of the related planning for the 1962 World’s Fair. Not that authorship matters here, as regardless of designer, it is exemplary of its type and a real treasure. Based upon previous strolls on Boston Terrace, it appears to have had some recent restoration work performed, and is sporting at least a fresh coat of paint and restored (or at least tidied-up) steel windows. The house itself has all the modernist cues: cubic form, bone white paint, steel corner windows, entry canopy, and assertive chimney. How I dream of more such beauties to be on the Hill -- even the perennially abused glass block is perfectly incorporated into the design! Greater than the sum of its parts, this house also displays a deft hand at proportion, scale, and overall execution that makes it among the Hill’s finest looking residences, all reason enough to take a stroll into Capitol Hill’s modernist enclave and witness is beauty first hand.